The Creation of a Pizza Monster! Building the oven itself is quite easy. The difficult part is deciding what to use for the foundation. As we all know, foundations are essential for any building. 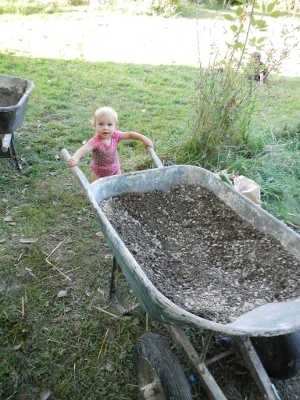 We had just completed our root cellar and had a bunch of extra small to medium sized stones lying in a pile. We also had extra chicken wire from the earthbag cellar project. I know that a light bulb just turned on in your head. 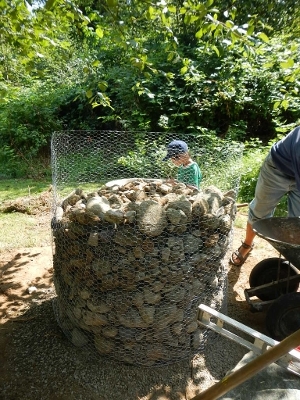 Put the stones in the chicken wire and tamp them down! That is indeed what we did. 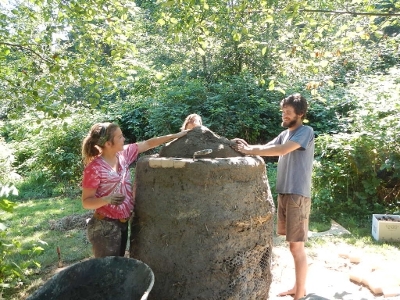 We were able to make a three and a half foot diameter cylinder of stones that was about four feet tall. There was still a little more than a wine bottle’s length of chicken wire extending beyond the stones. 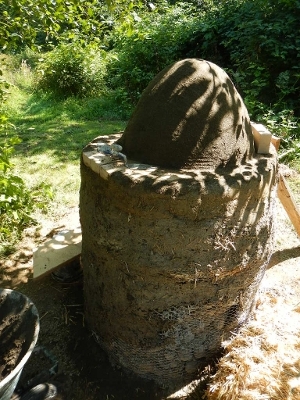 The next step of our cob oven construction was to make an insulated base. What we did was lay down about a three inch thick layer of straw, then mix up some slip straw type stuff with perlite. After that, we started inserting empty wine bottles upside down and backfilling between them with perlite. 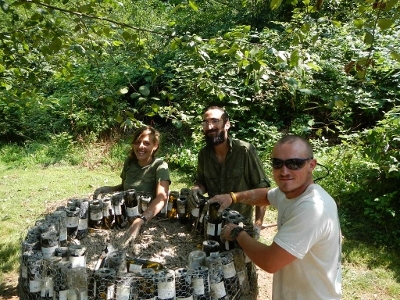 When the circle was packed full of about 80 wine bottles, we put another thin slip layer on top and leveled it. Fire bricks were placed atop that last layer in a way that maximized oven floor space. We also made sure all the bricks were on the same vertical plane (easier to slide the big pizza spatula in and out!). 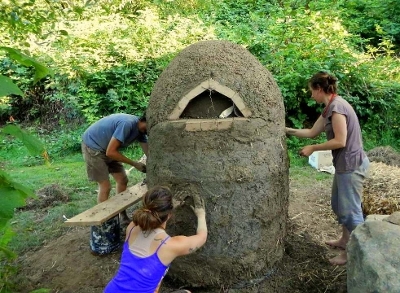 The “oven” part of a cob oven is just a void. The strongest voids on this earth are domes. 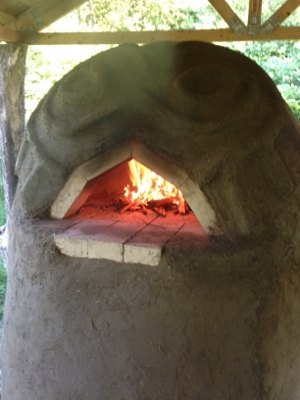 The interior of our cob oven is a dome. We used sand to make a form for the dome. A string tied to a pencil made a great compass for drawing a perfect circle from the exact center of the brick floor. The height of our form was about 70% of the diameter of the form. Strips of wetted newspaper were placed around the form as a separation layer between the form and the actual oven. This step was followed by the mixing and application of a thermal layer (which is a mix of coarse sand, sifted 5/8” gravel, and clay). This layer was about 3 inches thick and applied directly around the form. 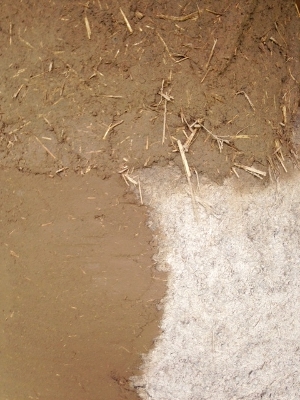 The second layer has a lot more coarse sand than gravel and also has chopped straw in the mix. This is the closest to regular cob that we got. This second layer was added in “cobs,” which look like loaves of mud. 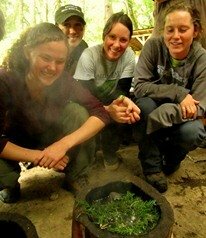 Earn Certificates in Permaculture Design and More. We used trowels to get as smooth a finish as possible to the cob oven. With the extra plaster, Isabel (a student) began to sculpt some eyes; then some artistic rays beaming out from them. It sort of looked like an Owl. It kind of looked like Jaba the Hut. It somewhat resembled a nightmarish koi. It looked exactly like a PIZZA MONSTER! Our poor pizza monster had her mouth filled with sand for a whole week while the oven set. We helped her out on that seventh day by removing the sand and starting a small fire inside her mouth. She breathed fire like a dragon while the newspaper burned off the thermal layer. She is now ready to start pumping out the pizzas. I want to thank everyone who had a hand in building this oven: Eli and Liam, Jason and Kerry and Kaia (pictured below), Vita, Jeremy, Ted, Haley, Isabel, Amanda, Eric, Marisha, Jamie, and Zack. Your cobbing is much appreciated! About the Author: Steve Nicolini is an experienced permaculturist and wilderness skills instructor. He taught at Alderleaf for several years. Learn more about Steve Nicolini.